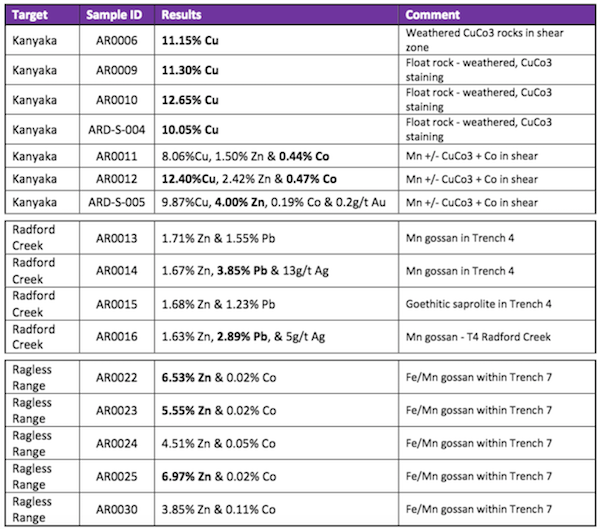 Auroch Minerals Limited (ASX:AOU) has today announced positive results from reconnaissance sampling at its 90%-owned Arden Base-Metals Project. 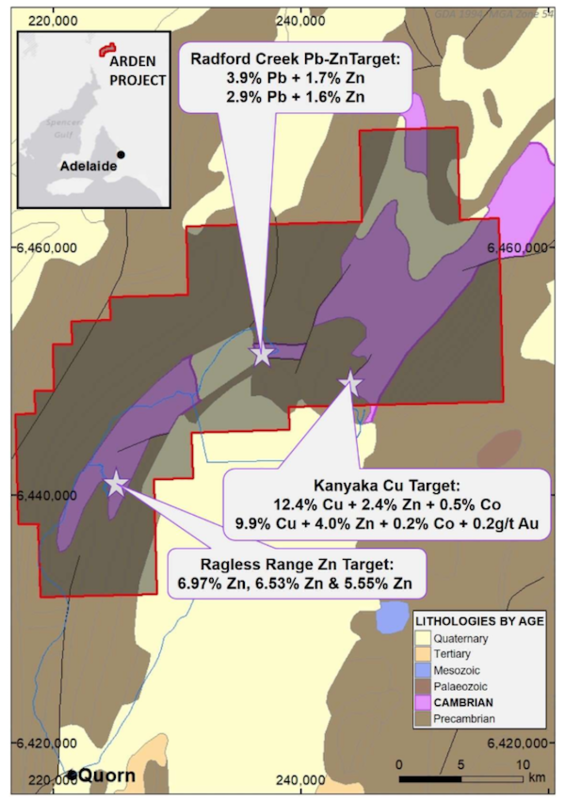 During recent reconnaissance field mapping and sampling, AOU has observed extensive sedex-style base-metal mineralisation at three of the advanced target areas at the Arden Project: Ragless Range, Radford Creek and Kanyaka. Importantly, high-grade zinc, copper and cobalt mineralisation was confirmed by laboratory analyses of rock-chip samples. Sedex (sedimentary exhalative) deposits, such as the giant Mt Isa deposit in QLD, account for over half of the world’s zinc and lead production. The Arden Project is located in the world-class base-metal mining region of South Australia, host to numerous large base-metal deposits including the Beltana zinc deposit, the Angas zinc deposit and the Kanmantoo Copper deposit. Radford Creek Lead-Zinc Target — results from rock-chips taken from existing trenches included 3.9% Pb and 1.7% Zn, and 2.9% Pb and 1.6% Zn. 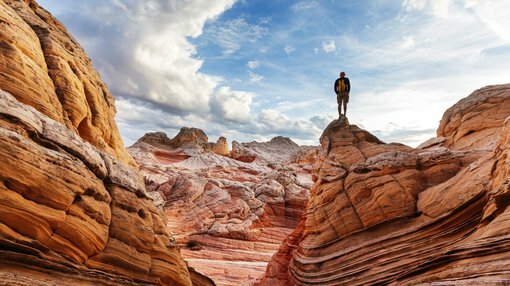 Of course, as with all minerals exploration, success is not guaranteed — consider your own personal circumstances before investing and seek professional financial advice. “The recent field work at the Arden Project has confirmed the presence of high-grade base-metal mineralisation over multiple target areas and highlights the potential for a substantial zinc, lead, copper and cobalt play supported by excellent infrastructure, which includes Nyrstar’s large base-metals smelter and refinery nearby in Port Pirie. “Auroch is excited by the prospect and has set an aggressive exploration programme to systematically evaluate the multiple target areas in 2018,” he said. AOU’s team has also observed and sampled existing trenches and old workings within the previously identified targets at Ragless Range, Radford Creek and Kanyaka. In-situ rock-chip samples were collected from trenches, creek beds and other outcrops, as well as float rocks on dumps surrounding the old workings. The Arden Project contains several historic artisanal mines for zinc, lead, copper, iron and manganese. Between 1966 and 1972, the company now known as Rio Tinto identified Sedex-style zinc and copper mineralisation potential over 10 kilometres of strike and up to 40 metres wide. A drilling campaign over the highest-priority targets in Q3 this year.